If you love being around, on or in the water, then you must try paddleboarding. Visit just about any body of water – ocean, bay, river or lake – and you’re likely to find someone on the water with little more than a paddle, a board and a PFD. Paddleboards provide a closer connection to the water world than boats. You can cross deep channels to visit an island, or skirt shorelines looking for marine life, or even navigate mangrove tunnels to escape the sun. Paddleboarding involves kneeling, lying, or standing on a surfboard-like platform with a bent paddle and propelling yourself forward through the water. It’s a fun, easy activity that’s not only great for your health but is also meant for everyone regardless of age. Paddleboarding is easy to master within a few minutes, but it also comes with health benefits. Stand-up paddleboarding, in particular, helps to strengthen your shoulders, back muscles, legs, and core. Find the right board. Your enjoyment of the sport is greatly diminished when you don’t have the right equipment. Find the board that is best suited for your size and purpose. Larger, heavier paddlers will require boards able to float them properly. Anglers will want a wider, more stable platform for casting, gear and fighting fish. Distance paddlers and racers will want certain hull characteristics that maximize their speed. Talk to experienced paddlers or visit an outdoor gear retailer who can help you determine the best board for your adventures. Paddle with your core, not your arms.This may seem counterintuitive since you’re using your arms to paddle, but you want to focus on your core muscles to help improve the power of your strokes. When you use only your arms to move the paddle, you’ll get tired pretty quickly. Face your paddle the right way. It’s common for beginners to hold the paddle so the angle of the blade is bent toward them. However, the blade and power stroke is more efficient when the blade is bent away from you. This puts less stress on the shoulders. 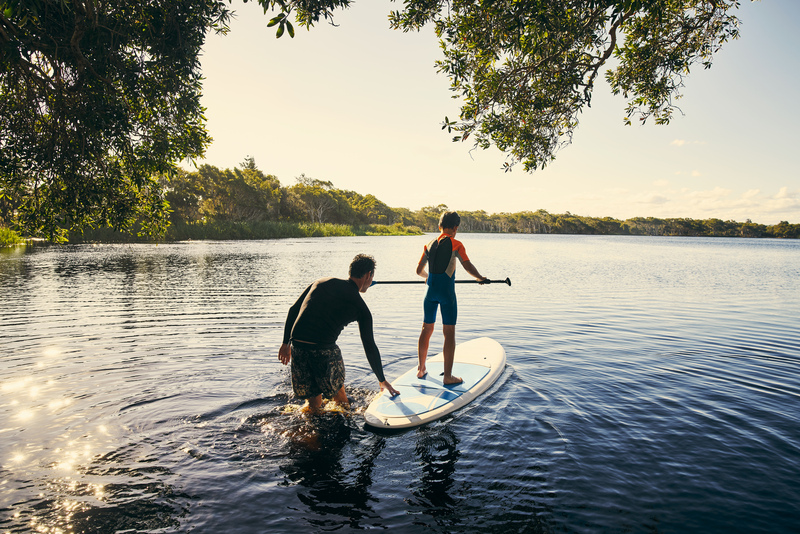 Paddleboarding is a great activity that helps you boost your health and brings you closer to nature. To learn more about paddle boarding, contact Bill Jackson’s today. We even offer free stand-up paddle boarding classes throughout the year.